Since we’re organizing a meetup during Spiel with No Pun Included, Jon Gets Games and Actualol during which we will be playing a massive game of NMBR 9… we thought it would be wise to actually get ourselves a copy of the game and know what it’s all about. It turns out to be a frustratingly good little puzzle game! What’s this meetup we speak of? Efka of No Pun Included went through the hassle of montaging the video below to explain it to you in detail. I’m sorry to say that there are no more tickets available and it was ‘sold’ out within one day. We’ll be at Essen on Thursday and Saturday and if you see us walking around we’ll have some cool stickers and rulebookmarks for you. Ýes, bookmarks for your board game rulebooks! Or just for your normal books if you prefer. 😉 We’ll be wearing Semi Co-op shirts and be looking around like lost little ducklings since this is our first board game convention ever. And remember that we mentioned Clash of Creators, the Star Realms tournament in our previous post? We somehow managed to end up in second place of our pool – meaning we will advance to the next round. Woooooooooow! … We’re so going to lose our next match… eh, I mean; BRING IT ON, WE CAN TAKE YOU! 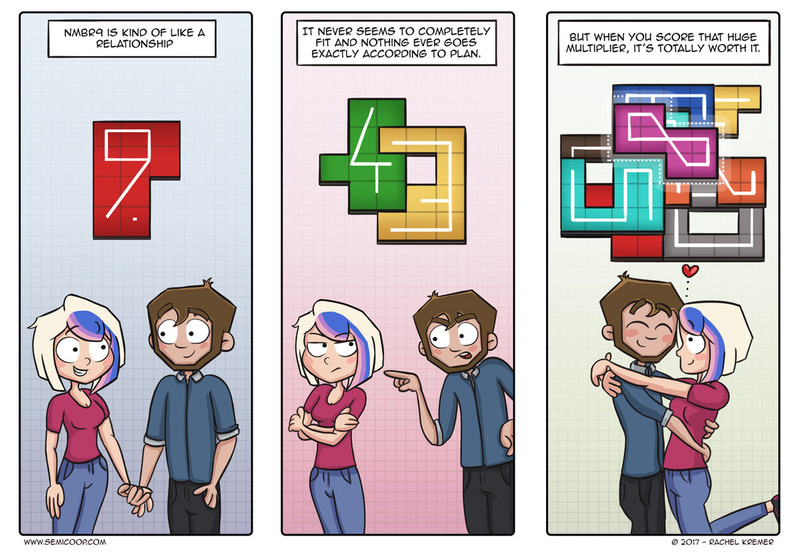 What other game is a good metaphor for a relationship? Codenames. It doesn’t matter that we don’t always understand each other. As long as we care and listen to each other it’ll all work out fine in the end, with some laughs along the way. Flamme Rouge: if you try too hard in the beginning, you’ll exhaust any chance of keeping up as your partner passes you by and the distance between you grows. However, if you keep pace with each other, you both will benefit from, er, “emotional drafting”. Get Bit! : if you lose your individuality and end up doing everything the same, you’ll both get dismembered by a shark … metaphorically speaking. Karuba: while the tiles your partner draws (metaphorically speaking) are totally random, you have to work with it or else you’ll hit a dead end.